To mark September’s Baby Safety Month, as recognized annually by the Juvenile Products Manufacturers Association (JPMA), baby bedding company Liz and Roo is highlighting the safety and design of their premium bumper-free bedding. Putting baby safety first, Liz and Roo strongly promotes bumper-free bedding options as recommended by the American Pediatric Society. As a safe alternative to the bumper, Liz and Roo offers the functional rail teething cover, which is included in all of the brand’s bedding sets. “We want to provide parents with innovative options that look great but also ensure they feel confident in the safety of their baby’s crib bedding. We are also committed to local manufacturing at Liz and Roo and all of our products are made in the USA. This enables us to oversee the full production process on-site at our mills, knowing confidently that our products meet all of the required production safety standards and are safe for little ones,” said Caroline Eager, Owner of Liz and Roo. Bumperless baby bedding has become a popular choice in nursery design with rail covers developing as a strong alternative. Rail covers are used to provide a pretty finishing touch to crib design and serve the function of protecting the wood against teething marks. Liz and Roo’s rail covers are available in a variety of fun and upbeat designs such as Gray Elephants, Sky Blue Trellis and Cloud Linens. Parents can mix and match covers and styles with rail covers, skirts and blankets, adding rail covers on both the front and back of rails. A formal federal investigation into the safety of crib bumpers is still under review, but a representative of the The Consumer Products Safety Commission (CPSC) is on record saying, “bare is best.” The JPMA and the CPSC also advise that crib mattresses should be firm and fit snugly, with only fitted sheets made for crib mattresses to be used. It is also recommended that a wearable blanket or other sleeper should be used instead of a quilt or blanket in the crib. For more JPMA safety recommendations and information please visit Liz and Roo. In recognition and celebration of Baby Safety Month, Liz and Roo is pleased to be offering 50% off of their Blue, Gray and Pink Minky Little Roo Lovey Blankets. As seen on ABC7 New York’s Secret Sales, these small security blankets provide comfort to babies. 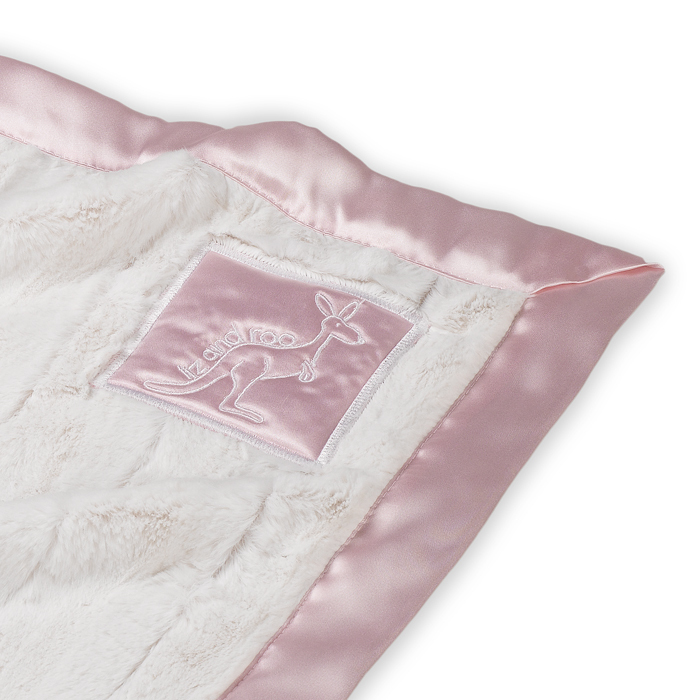 Made by local sewing artisans, the Little Roo security blankets are made of real satin and luxe minky, a faux fur. Liz and Roo, a division of American Made Dorm & Home, is the premier designer, manufacturer and retailer of made in USA baby bedding and bumperless crib sets that emphasize safety, workmanship and style. A women-owned business, Liz and Roo’s products can be found in more than 120 specialty baby stores and juvenile furniture shops throughout the USA and Canada. Liz and Roo was founded in 2012 and is headquartered in Louisville, Kentucky with production facilities in Sylva, North Carolina. For more information and to view Liz and Roo’s complete assortment of baby bedding and accessories please visit http://lizandroo.com/.